HIM has long been a staple of health care institutions. From the outset, the profession has focused on maintaining an accurate account of what transpires during patient encounters. Before the birth of HIM, recordkeeping was the responsibility of the medical records department or what has been referred to as the medical records library. When utilization review and clinical documentation improvement (CDI) entered the equation in the 1990s, it presented HIM with its first opportunity to capitalize on expanding its reach. Traditional HIM focused on ensuring a record was created for every patient, the proper entries were generated for each encounter type, and the file was catalogued and retrievable. However, broadening the scope of HIM to encompass a focus on the record's content did not gain a robust following to create the needed evolution. Through its proximity to the records themselves, HIM had the inherent ability to oversee the utilization review and CDI functions. The second transformation dealt with the switchover to the HIM designation, an effort to redefine the profession and raise the possibility of becoming partners with other information-generating and oversight bodies in areas such as IT and revenue cycle management. This transition was more successful and afforded HIM the ability to grow by retaining the right to become experts in HIPAA, coding, and electronic information capture initiatives. The perfect storm is brewing for another transformation of the HIM profession. Recordkeeping is no longer tied to notations on a form or an array of screens that are bolted to a single encounter. Through the invocation of federal meaningful use initiatives, the industry has been forced to implement electronic information technologies. A medical record becomes much more virtual once it is completely generated electronically. Systems typically capture data and information in either discrete fields or database entries. The data are then culminated, populated, and formatted according to programming specifications to display onscreen, in a report/printout, or through a portal. 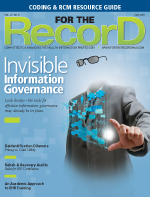 The traditional medical record is now cyber based; it is no longer tangible. Therefore, it must be defined based on the facility's business needs and the technology's capabilities. Because it is early in the information industry revolution, much of the planning remains conceptual. Brainstorming, collective thinking, and visionary expertise are needed to develop a somewhat abstract idea that defines and redefines the capture and usage of information so that it is relevant throughout its life cycle and beyond customary retention timeframes. For instance, who owns the information? Does a facility's ownership now belong to attestation and authentication of an entry rather than the entry itself? Is there an approach that allows patients to make notations and take ownership of their information? How is the integrity of entries maintained and to what point through an electronic information exchange does the facility continue a responsibility for reliability, confidentiality, and accuracy? Another new age HIM transformation is under way. There is a need to formulate information governance programs that determine the appropriate generation and usage of data and safeguard its integrity and authenticity. HIM is attributed with the fundamentals needed to become data stewardship leaders and information management consulting experts. The new age of HIM must have the foresight and adaptability to support a lifelong record across a continuum of health care entities and ongoing retention for sustained population health improvement initiatives. The current transformation affords HIM practitioners an opportunity to evolve, engage administrators, and serve as information stewards. To seize this, HIM professionals should evaluate industry literature for commonalities and mainstream schools of thought as well as showcase their ability to serve as data quality leaders. In the August 2012 edition of the Journal of AHIMA, Chris Dimick wrote, "Some job roles will wither while others will blossom. And the HIM mindset and education will need to adapt." The profession receives another call to action in the Advance Healthcare Network's March 2013 article "From Maintenance to Management: The Evolution of HIM" by George Abatjoglou and Shiny B. George. "While EHRs make data collection faster and easier, providing solid quality control requires an understanding of where the data comes from, where it is going and how best to protect it," they wrote. Current EHRs have been developed with a focus on simplified data entry and easy access to information in different formats and displays. However, many EHRs can't ethically process corrections, document late entries, support the entire patient encounter through a chronology of entries and audit trails, or provide documented descriptions of metadata, integration points, and system logs. These deficiencies add up to a huge opportunity for a set of professionals with a thirst for detail and accuracy. The HIM skillset is an ideal fit for projects involving data and information planning to ensure high credibility and overall systematic approaches are undertaken when it comes to recordkeeping and custodianship. HIM continues to boast the highest regard for proper data and information governance when compared with other industry domains. Auditing and validating accurate and complete data has remained a fundamental concept of the field throughout its existence. HIM 2.0 is the next evolution. Industry-leading organizations such as AHIMA and HIMSS have been calling on HIM professionals to act as catalysts in reshaping the way the profession is viewed. It may be that the time has come to rebrand HIM and completely overhaul its conventional makeup. With health information becoming viewed as an asset, the ability to develop ideas to efficiently govern, manage, store, retain, retrieve, safeguard, and promote integrity will be the largest contribution HIM can make. As more organizations look to leverage EHR data for clinical improvements, budgetary projections, and support for patient portals, HIM's role will morph. It is imperative that HIM leaders take this development to heart and begin to operate under the new model. This may mean diversifying knowledge and surrendering control over certain traditional HIM aspects (such as release of information, coding, and deficiency management). Getting this revolution off the ground may include such activities as "sunsetting" out-of-date policies and procedures, destroying "expired" paper records, revising job descriptions, modifying department missions, and changing the way HIM interacts with other areas of the facility. HIM professionals should accept any call to action that would require participation in local chapters, regional health information exchanges, data councils across entities, or the formulation of their own expert panel. The HIM 2.0 effect must be welcomed and practiced by novice and seasoned HIM operators to ensure the profession continues to grow and evolve. — John H. Dickey, MSHI, RHIA, is the EHR director of clinical systems optimization at HCA.